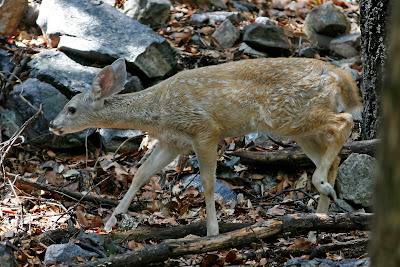 One of the highlights of my recent trip to Ramsey Canyon was a small group of White Tailed Deer (Odocoileus virginianus) wandering near the stream. A monsoon thunderstorm had just meandered through the canyon, and it was clear that the deer had gotten a bit wet. The entire group (appeared to be two females and one fawn) had very little fear of me and another hiker nearby, and continued to graze on some of the grasses growing in the wooded canyon. White-tailed deer while not uncommon in Arizona, are not nearly the common siting as in much of the Eastern USA. In fact, I've seen many more Mule Deer in Arizona than white tailed. The range of the White tailed pokes into southeast Arizona and up through the Mogollon Rim country and into the Grand Canyon area of Northern AZ. Mule Deer, on the other hand, inhabit most of Arizona, including some lower desert areas. In Ramsey Canyon it is unlikely that these deer have any consistent predators. Occasionally Black Bears are seen in the canyon, but they typically leave deer alone. Mountain lions are also very rarely seen, which would probably represent the primary threat to these deer.